Click on the links to see close-ups of the areas of the picture mentioned. We are currently remodeling this room, We plan to paint the walls in pony colors! We are going to build custom shelves too. It will be hard to do because we will have to put the ponies somewhere! On the wall you can see some of my MOC petites, some carebear stickers and my MLP watch. Actually, hanging UNDER the watch (hidden from view) is a MOC Wall clock from the UK. Below the MOC petites you can see my stables. One is the show stable and the other is the Happy Home. I don't have the one for Megan, but if I did, where in the world would I put it? (I wouldn't turn one down though!) Below that, on the floor you can see my petite houses and shoppes, and my MIB Songster. Hanging from the ceiling is a portion of my plush collection. As you can see, I have the tag on some of them. 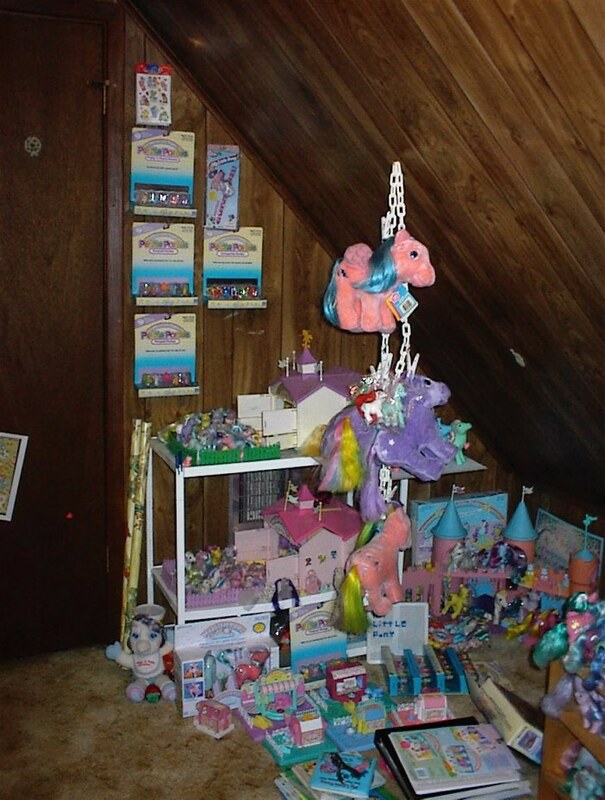 Also hanging around with the plushes is Mail order SeaBreeze and the Rice Crispy Mail Order baby christmas pony. In the corner is my castle with my princess ponies. In the floor are some more MOC petites and the box for one of the shoppes. If you look really close, you will see my sea ponies there in front of the castle, with all their little floats. There area also some books and coloring books laying there in the floor. Most of the coloring books were MINE, and yes, I colored in them, although there ARE some uncolored pages. (a LOT of them actually) ALSO, There is a stack of the Cards that the Ponies USED to be Mint on. (AS in MOC) If you look really closely, you can see some of the MLP little critters, on the shelf with the Home Sweet Home. You can also see that well meaning people who knew I loved Ponies bought me a few fakies.. look in the lower left hand corner for a fake plush talking pony. As a rule, I don't like fakies, but she was sweet. She came with an apple shaped baby bottle that fits in her mouth. Also, you can't see them because they are in bags, in a box under the shelves containing the stables, but check out my combs and brushes.